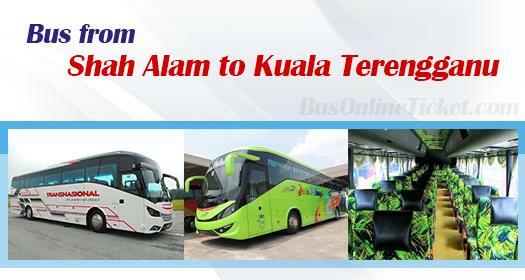 Bus from Shah Alam to Kuala Terengganu is the most convenient transportation for local passengers. Besides locals travelling back to hometown Kuala Terengganu, some locals travel to Kuala Terengganu to visit Perhentian Island and Redang Island. That is because Kuala Terengganu is the gateway to the two famous island. Jasa Pelangi Express and Transnasional are the two bus operators offering bus from Shah Alam to Kuala Terengganu. Their buses run daily between 10am to 10.30pm. Jasa Pelangi Express is the largest player for this bus service by providing 5 daily trips whereas Transnasional provides 2 daily trips. The bus fare for bus from Shah Alam to Kuala Terengganu is reasonably charged in a range of RM 44.60 to RM 46.00, depending on your choice of bus operator. The duration from Shah Alam to Kuala Terengganu takes about 7 hours, depending on traffic and weather condition of your departure day. 1 washroom break will be given during the journey. For the bus from Shah Alam to Kuala Terengganu, the boarding point in Shah Alam is Terminal Bus Shah Alam (Seksyen 13). Passengers can easily access to Terminal Bus Shah Alam (Seksyen 13) via intercity bus and taxi. The arrival point in Kuala Terengganu is located at Terminal Bus MBKT. Passengers arriving at Terminal Bus MBKT can get to Shahbandar Jetty or Merang Jetty for to Perhentian Island and Redang Island by taking taxi. For people who want to have their diving and snorkelling in Perhentian Island and Redang Island, you are advised to book online in advance especially during holiday season. BusOnlineTicket.com is convenient portal to secure your ticket from Shah Alam to Kuala Terengganu. Instant confirmation at BusOnlineTicket.com gives you the peace of mind that you have your ticket in place before you travel.